LANCASTER – The Little Misses of the Antelope Valley recently provided Thanksgiving dinner to homeless cats and dogs at the Los Angeles County Department of Care and Control, Lancaster Animal Shelter. The effort was led by Little Miss Antelope Valley/ Edwards Air Force Base, Floriani Escobar, and her parents Santos and Griselda Escobar. 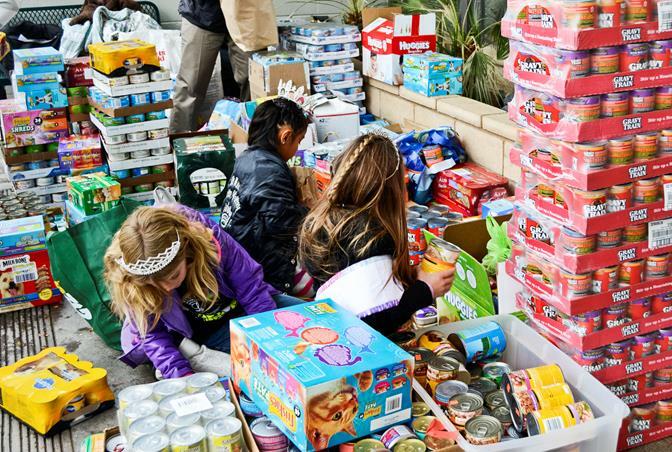 According to Escobar, each year Little Miss Antelope Valley is responsible for organizing and hosting the animal food drive to provide the animals with a “yummy” canned dinner instead of the dry-food they are fed on a daily basis. This year, the Little Misses broke the record for most cans collected at 3,792 cans, with an additional 125 pounds of dry food. The previous record was set at 3,190 cans. Each Little Miss was tasked with collecting donations in her own community. As a student at Branch Elementary, Escobar was given permission to host a two-week food drive at school. The class that brought in the largest collection of cans won a pizza party. 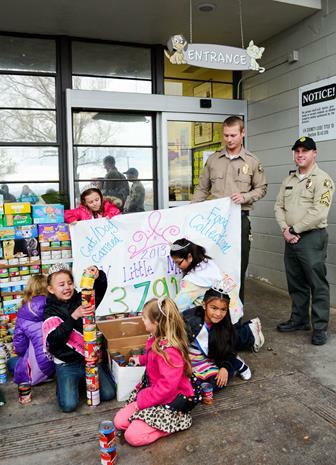 By the end of the drive, Branch Elementary had supplied 1,037 cans of food. During her Thanksgiving break from school, Floriani will spend two days volunteering with project “Blessings in a Bag” to feed the homeless for the holiday. 12 comments for "Little Misses donate Thanksgiving meal to local shelter pets"
My best dogs have found me, the stray that comes, nobody ever claims them…. No microchip…. Or old address and right timing with my home situation…. But I do find myself cursing through the pound every 5 years or more and this time the “rescues” snatching up dogs was a joke and then seeing the “rehoming fee”…. Call it what it is, not rehoming, it is selling….. So a breeder selling a dog of a breed people want is not much differant then reselling what you get at a pound…. Puppy mills, yuck…. But breeders…. They are easy to spot out, grass…. Not dirt, clean yards and healthy dogs running around and puppies well taken care of… No smell of crap and urine…. No flies…. If the breeder has nothin but dirt, smell of crap, kennels everywhere, and pushing little pups not very old…… Walk away…. Sorry you feel that way. We have made permanent homes for serveral animals from the pound. It doesn’t matter where you find the “love of your life partner, ” They still need med care, training, and a lot of love, no matter where you get them. This is awesome. Animals really don’t have a choice in their destiny. They don’t have Grandmas, Cousins or Aunties to take them and get paid for it. I agree about the rescue issue and all the charges they have. I think a rescue should only be able to take a dog from death row. It irritates me that most rescues will not take a dog that a neighbor has found as a stray even after months of trying to find it’s owner who possibly dumped it in the desert. These kids are doing a wonderful thing. Children who love animals ROCK! God bless all who donated to the poor animals in the shelters. If anyone can adopt one of these wonderful dogs, what a wonderful Thanksgiving that would be! I rescue deserving dogs from the shelter. The cost of the dogs is a drop in the bucket. One dog I just pulled came down with parvo at a cost of $1200. Her adoption fee certainly didn’t cover that and all the other expenses. The advantage of a rescued dog is that the rescuer keeps the dog long enough to make sure it is healthy and to evaluate temperament to find a good fit for the dogs’ new homes. One of the dogs I currently have had five people interested yet none took him. He is yours if you want him. Lovely energetic youngster. You’re spending to much on parvo. Next time take your pup to Uno’s. (blvd vet) Dr. Dave will let you take a IV with fluids (as dehydration is what kills the dogs) home so the cost is under $400. I agree with you! Dr. Ruper and Dr. Dave have done wonders for our dogs and cats we have gotten from the shelter! We have an unexpected situation happen to our “sube” Shepard. Now she runs around healthy on our 2 acres! We wouldn’t take our animals anywhere else! I ran into the same thing with these “non-profit dog rescues” in their contract they want to come and inspect your home whenever they want etc? So I decided to go out and buy a pup from a breeder. There is no advantage of getting a dog from the pound or a dog rescue. Most of the time the dog is too damaged and a mental case. @Frank Rizo- I could not DISAGREE with you more! Our 2 dogs came from a rescue. Yes they came out and inspected our home and yard and we had to agree that we would contact them if things didn’t work out. I appreciated all of that. All of our pets, past, present and future will be rescues. There are so many animals (dogs, puppies, cats, kittens etc) in need that it makes no sense to continue breeding them just to make a profit. I’ll take a mutt over a purebred any day. If you must have a purebred please consider a breed specific rescue.